but the National Electoral Committee extended the deadline until July 3, 2017. This is to advise that Unifor National Council 4000 – Locals 4001, 4002, 4003, 4004 and 4005 – will be conducting an election for the position of President for National Council 4000 for the remainder of a three-year term that expires on or about December 31, 2019. 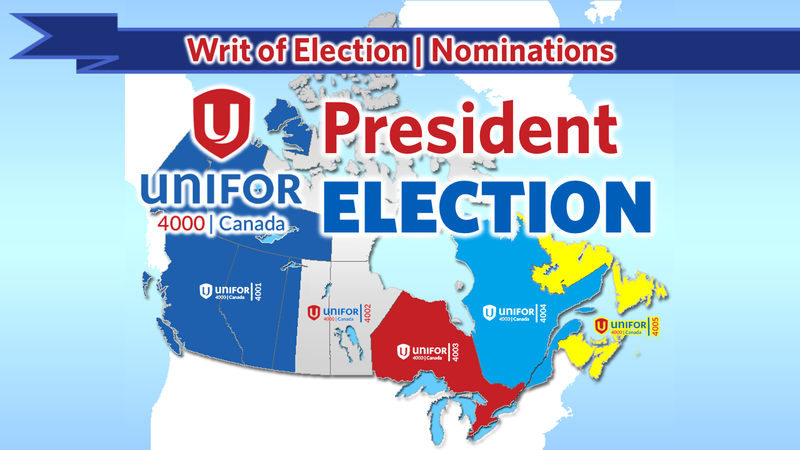 ​This election is being called due to the departure of President Barry Kennedy who was appointed by Unifor National President Jerry Dias as a National Representative. Kennedy was recently acclaimed to a new three year term at the Council 4000 Convention in Winnipeg on November 25, 2016. Candidates may submit a Statement of Qualifications. Tap here to read the Guidelines for Candidates, details and to download a nomination form. Nominations must be received no later than 23:59 Local Time Friday, June 16, 2017. All candidates shall be able to withdraw their nomination no later than 12:00 NOON EST on Monday, June 19, 2017.